"If Bruno told you that he can play the harp, he's a barefaced lyre." "Only you can prevent forest choirs." You're supposed to be advertising Hofmeister, not Harp! 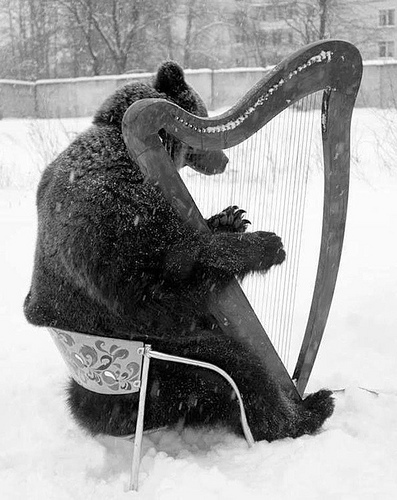 "Can't bear to look...it pulls at your harp strings"
Rhapsody In Baloo...By George Bearshwin. I know you can't bear the cold,stop harping on about it. Take the photo already, I'm freezing my arse off here. "Don't take that tone with me, young man!" Wilfred knew the importance of taking time out to ♯-en his claws. He was accompanied by the Wolf on the Whistle. WILL WORK FOR TABLE SCRAPS. Bears go to heaven as well you know. "Yes, he's a bit pissed off that he got this job, he really is a good drummer and wanted to do the Cadbury's commercial." Old folks home for Care-Bears: Melody-Bear strums and reminisces ... "Do you have a place where rainbows grow..."
I can play better, but that giant ghost head behind the wall is freaking me out man. "You know what love? I didn't believe you when you said you'd bought an old T.V star. But now I look at him I really think he is Gentle Ben." It's Baloomin' freezing out there. "Come inside love, before you catch your death." "Oh stop harping on woman!" Apparently, he ate Simon Smith and went solo. It's probably the Guinness that's given him a sore head.